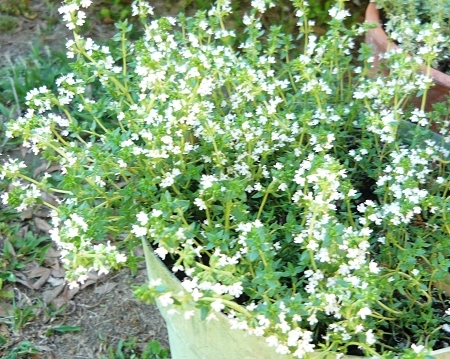 French Thyme - Also called "Summer Thyme" used extensively in French cuisine. Sweeter more delicate flavor than English Thyme. Long narrow grayish-green leaves, masses of white flowers when in bloom. Beautiful container plant. Seems to thrive better than English Thyme in warm climates. Perennial zones 5-9. Live starter plant in 3 inch container.